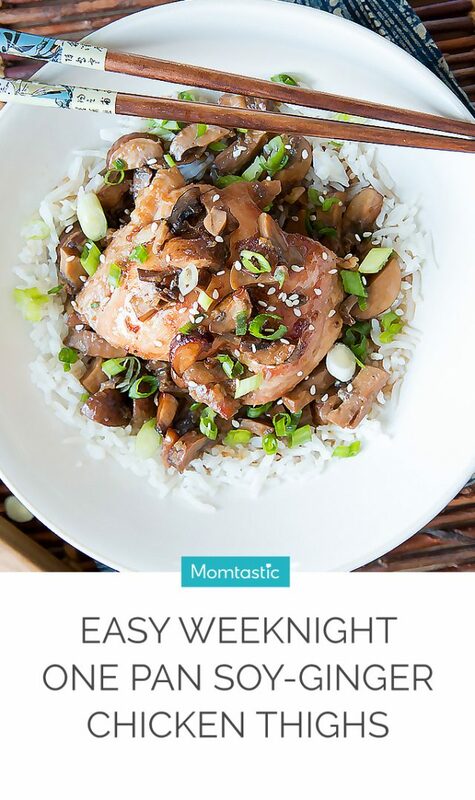 Boneless, skinless chicken thighs are by far my favourite thing to cook for a satisfying weeknight meal. They don’t dry out like chicken breasts when baked; they remain juicy and have a meatier, richer flavor. Boneless skinless thighs are also immensely versatile; In the past I’ve experimented with middle eastern spices, or tangy bbq sauces, but for this recipe, I combined soy sauce with sesame oil and plenty of fresh garlic and ginger. 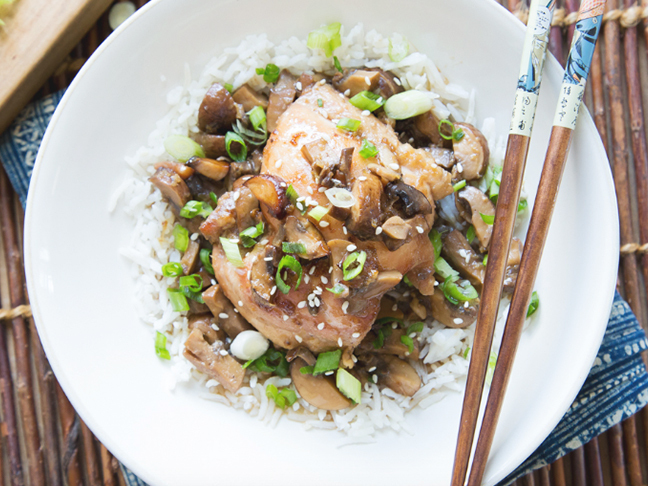 Cook the thighs in a high-heat oven over a bed of mushrooms, in a savoury sauce loaded with umami flavors. This one pan meal is prefect for weeknights because clean up is easy, and dinner is on the table in under an hour. Once the chicken is cooked through, after about 40 minutes, there will be lots of savoury juices in the pan you wont want to waste, so cook up a pot of rice to serve with it! Step 1: Preheat oven to 400 degrees F. Place the diced mushrooms in an 8x8 ceramic baking dish. 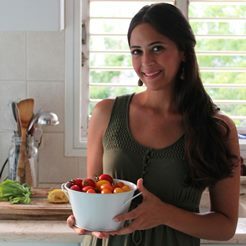 Step 2: In large glass measuring cup, or small bowl, whisk together the oil, soy sauce, finely grated garlic, ginger, honey, sesame oil and black pepper. 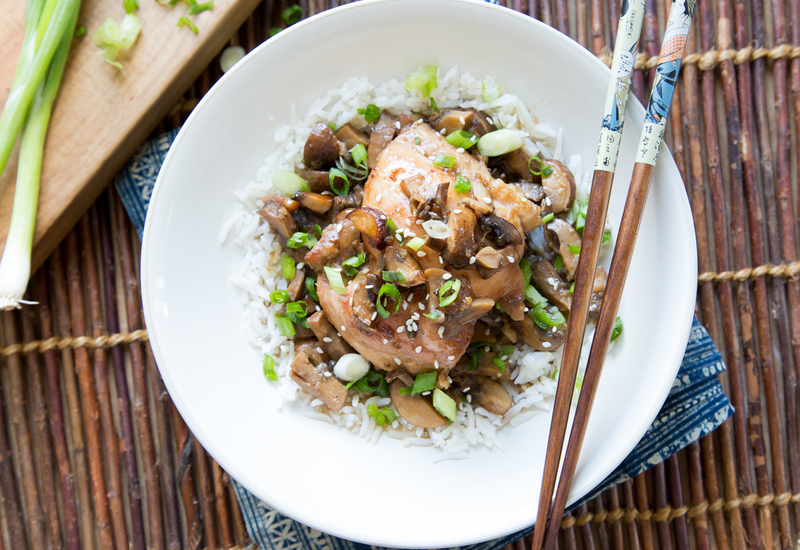 Step 3: Place the boneless skinless chicken thighs over the bed of mushrooms and pour the soy garlic mixture over the chicken pieces. Bake for 40 minutes uncovered or until the juices are bubbly and the chicken is golden. Step 4: Before serving garnish the chicken with thinly sliced scallions and sesame oil. 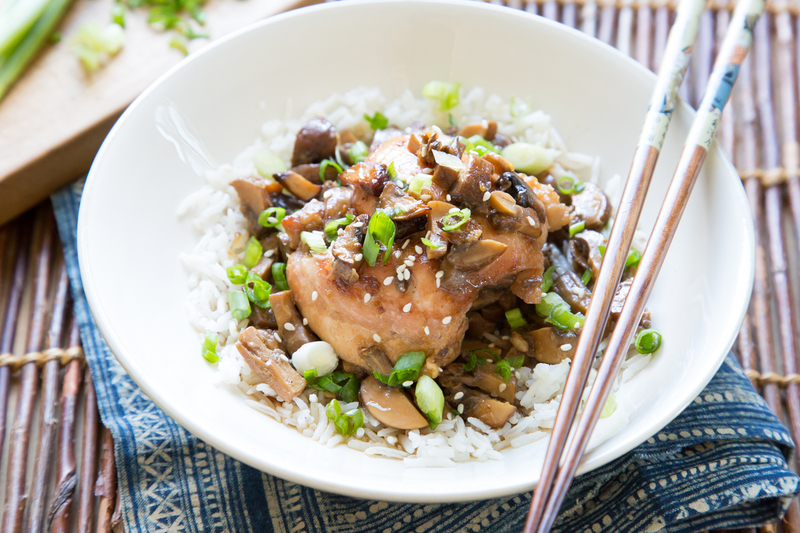 Serve the chicken over steamed rice to complete the meal!